Interpretations Vol. 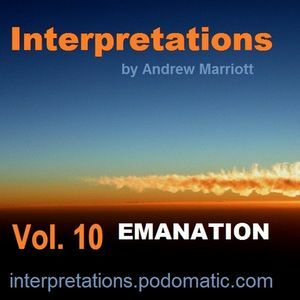 10 "Emanation" is a live weekly show mix by Andrew Marriott on Newagesoul.com. Featuring: Fabio Genito - Papawenda (Remix, new on Deeper Shades Recordings), 83 West (unreleased rub), Neter Supreme, Dave Mayer, Anthony Nicholson, Jimpster, Louis Benedetti & Sy Smith, Beaten Soul feat. Dawn Tallman, TJ Cases pres. J-Key, Nick Holder feat. Lee anne King, KemeticJust feat. Terrance Downs, Jaidene Veda, Reelsoul, Jon Cutler, Teedra Moses, Black Coffee feat. Thiwe, BabyFace Jay feat. Elrae, At One, DJ Le Roi feat. Donald Sheffey, Jannae Jordan, Louie Vega, DJ Spinna, Quentin Harris, Rocco, Tony Loreto and more.